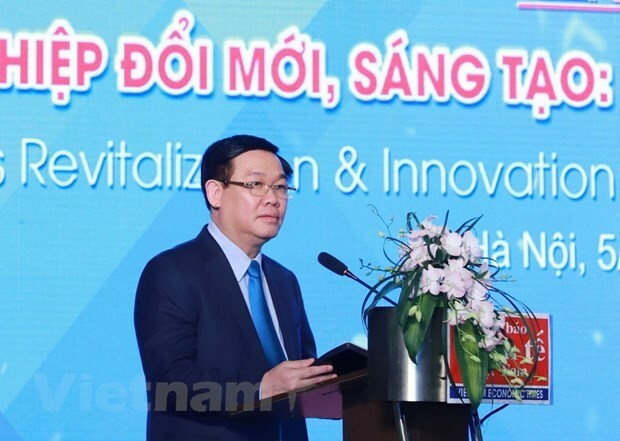 Hanoi (VNA) – Deputy Prime Minister Vuong Dinh Hue has urged domestic firms to embrace digital transformation at a recent business forum. Addressing the CEO Forum 2019 in Hanoi on April 5, the Deputy PM said the fourth industrial revolution has a strong impact on the economy and society around the world and all sectors and fields with unprecedented speed. As Vietnam is deeply integrated into the world economy, the country faces many challenges but also has multiple opportunities, he told the forum, stressing that to shorten the development gap with other countries, digital transformation is a vital step for businesses to stay afloat in the Industry 4.0 era. Deputy PM Hue said in recent years, the Party and State have advocated the transformation of the growth model based on the application of science, technology and innovation to improve productivity, quality and the competitiveness of the economy. “The Government has been continuously improving the business and investment environment , strengthening macro-economic foundation, promoting entrepreneurship and creating the most favourable conditions to support business development,” he said. He noted that the Prime Minister and the Government have adopted drastic measures to develop an e-Government, building a digital economy, embracing digital transformation and applying 5G technology, building an institutional framework to pilot new business models such as non-cash payment, e-payment, peer-to-peer lending and shared economy. Deputy PM Hue stressed that every business must be a centre of innovation to be successful, adding that they cannot go alone, and the Government, ministries and localities are committed to accompanying enterprises in the future.